Multifocal atrial tachycardia (MAT) is a rapid heart rate. It occurs when too many signals (electrical impulses) are sent from the upper heart (atria) to the lower heart (ventricles). The human heart gives off electrical impulses, or signals, which tell it to beat. 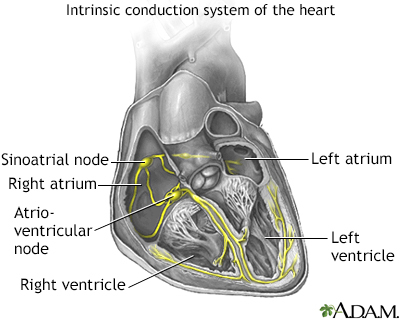 Normally, these signals begin in an area of the upper right chamber called the sinoatrial node (sinus node or SA node). This node is considered the heart's "natural pacemaker." It helps control the heartbeat. When the heart detects a signal, it contracts (or beats). The normal heart rate in adults is about 60 to 100 beats per minute. The normal heart rate is faster in children. In MAT, many locations in the atria fire signals at the same time. Too many signals lead to a rapid heart rate. It most often ranges between 100 to 130 beats per minute or more in adults. The rapid heart rate causes the heart to work too hard and not move blood efficiently. If the heartbeat is very fast, there is less time for the heart chamber to fill with blood between beats. Therefore, not enough blood is pumped to the brain and the rest of the body with each contraction. When the heart rate is less than 100 beats per minute, the arrhythmia is called "wandering atrial pacemaker." A physical exam shows a fast irregular heartbeat of over 100 beats per minute. Blood pressure is normal or low. There may be signs of poor circulation. If you are in the hospital, your heart rhythm will be monitored 24 hours a day, at least at first. If you have a condition that can lead to MAT, that condition should be treated first. MAT can be controlled if the condition that causes the rapid heartbeat is treated and controlled. To reduce the risk of developing MAT, treat the disorders that cause it right away. Olgin JE, Zipes DP. Specific arrhythmias: diagnosis and treatment. In: Bonow RO, Mann DL, Zipes DP, Libby P, Braunwald E, eds. Braunwald's Heart Disease: A Textbook of Cardiovascular Medicine. 10th ed. Philadelphia, PA: Elsevier Saunders; 2015:chap 37. Zimetbaum P. Cardiac arrhythmia with supraventricular origin. In: Goldman L, Schafer AI, eds. Goldman's Cecil Medicine. 25th ed. Philadelphia, PA: Elsevier Saunders; 2016:chap 64.